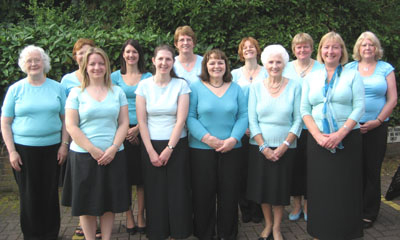 Whether you just stumbled across this website or were hunting for a choir to join, welcome to the Codsall Singers. Here you will find all the information you need to join the choir, or to book us for your event or function. In the last few years we have sung at weddings, birthday parties, church events and for several groups that are looking for some lively entertainment. We are a popular choir with 30 members. I believe the reason we attract so many people from different ages and backgrounds is because of the friendly atmosphere at our meetings and the fantastic songs we sing. If you enjoy songs from musicals such as Oliver, Mamma Mia, We Will Rock You and Les Miserables, or you like 16th century madrigals, Frank Sinatra, Chattanooga Choo Choo and songs by Karl Jenkins, then look no further. We have a wonderful Christmas repertoire with songs such as White Christmas, Away in a Manger and Mistletoe and Wine – and of course our popular Twelve Days of Christmas. We meet on Thursday evenings, during term time, at the Forget-Me-Not Club in Codsall and anyone is welcome to come along and give us a try.